Julian Darley is the author of High Noon for Natural Gas. He has master’s degrees in science (social research and the environment) and journalism, and is currently researching sustainable decision-making. On Valentine’s Day 2007, we immigrated from Vancouver, B.C., to Sebastopol in Sonoma County, Calif. To our surprise, the house we’d rented, sight unseen from an ad on Craigslist, had a double-sized lot. The third of an acre was in a very run-down state; it had been used as a Rottweiler and pig run by the previous tenants. Our request to turn the yard into a garden was granted by the landlord, and the Energy Garden was born. For some years we had been concerned about climate change and energy depletion and how a liquid fuel shortage would affect the world’s food supply system. With our colleagues at the University of British Columbia and the University of Kentucky, we were looking at small-scale farms to see whether they could be energy self-reliant. The first thing that sprang to mind when we saw the yard was a question: can a family, in the middle of a town, be food and energy self-reliant, and even have some left over to share? Our garden would be an experimental demonstration. Its goal was to produce as much food and fuel as possible with as few outside inputs, especially petroleum, as possible. We wanted to produce the “five Fs” in our garden: food, fuel, fiber, fertilizer, and feedstock — all things that we currently rely on petroleum for. We were also interested in the calorie. How many calories could we grow, both to eat and to turn into other forms of energy, and how could we demonstrate different methodologies of gardening to the public? We used John Jeavons’ book How to Grow More Vegetables as a guide for the Grow Biointensive method, which advocates double digging of beds and helps calculate expected yields from areas of land. We also drew on permaculture methodology, including “guilds” of mutually beneficial plants, and crops with “stacking functions,” where many parts of the plant are useful for different purposes. We also staggered our plantings, following market garden techniques, to keep the beds continually in use growing food, energy, or compost crops. All of the garden work was done by hand. We started in March 2007 with forty 10’×4′ beds, and a few weeks later we added three 30’×4′ beds. Then we turned the whole front yard into ten 15’×4′ beds. To use water most efficiently, all of this was drip-irrigated by a computer-controlled timer. By the time summer came, the last open space of the backyard had been turned into a mandala garden with 3 concentric rings, using the layering method and planted with cover crops to wait for spring. By autumn, all the trees had guilds around them planted with berries, rhubarb, and shrubs. A small section demonstrated “square-foot gardening,” to show people that they could start small. And in summer 2008, the front side-yard demonstrated the “Do Nothing” method that some farms use to minimize soil erosion: we established a cover crop of clover and vetch, then cut it short and planted starts of quinoa into it. In order to get plants started quickly, we built three cold frames and a temporary greenhouse out of hay bales and clear plastic. Since we wanted to focus on calories and to show people the plants that they eat, we grew grains: wheat, amaranth, millet, quinoa, buckwheat, corn, and oats. We also planted traditional vegetables, such as tomatoes, broccoli, cauliflower, kale, cabbage, squash, watermelons, beets, and beans. Over time we also learned what didn’t work in the Energy Garden — such as potatoes, which were eaten by the gophers. There were wonderful old apple trees on the property, and we planted more fruit trees and berry bushes. Our medicinal and culinary herb beds did quite well. We grew echinacea, and our basil was the envy of the town. It may sound strange, but if you are to have a sustainable production garden, your first and last task is to grow your soil. This means building the organic matter as well as keeping up vital nutrients such as nitrogen. The traditional way to do this is by making compost and, if possible, keeping chickens. Making compost is not terribly difficult, but a good compost pile needs the right mixture of carbon-rich matter (for instance, straw) and other vegetable matter. We found it very effective to keep the compost piles in the chicken run. This way, new kitchen scraps and other vegetables got thrown on top of the compost pile, and the chickens eagerly eat what they want while conveniently depositing their nitrogen-rich fertilizer into the pile. The resulting compost was like rocket fuel for the plants. We grew oilseeds for biodiesel, high-sugar crops for ethanol, and cellulose-based crops for potentially making biofuels. We wanted people to see some of the crops that were being discussed in the news. For oil: Peredovik sunflowers, corn, canola, soybeans, and flax. For sugar: Dale sorghum and Jerusalem artichokes. For cellulose: switchgrass and miscanthus grass. It was great fun to watch these crops grow. The sorghum, for instance, touched the power wires at the front of the house — about 15 feet high. We experimented with many energy machines, such as small wind turbines, solar panels, biogas digesters, and oil presses for biodiesel. Our most in-depth experiment was making ethanol both from excess apples and from sorghum juice. After much searching we managed to find and transport a sorghum mill with which to squeeze the juice out of the fat, green sorghum canes. This machine weighs 400 pounds and is more than 100 years old (see Dale Dougherty’s write-up in MAKE, Volume 17, “The Lost Knowledge Catalog”). With a 20-foot pole strapped onto the mill shaft, and about a dozen volunteers, we squeezed a couple of gallons of juice out of the sorghum canes on the lawns of O’Reilly Media. We boiled part of it down to make sorghum syrup, which is a bit like maple syrup. Another part we fermented to make ethanol. But thanks to lack of temperature control, and possibly pilot error, we produced nothing usable. Producing ethanol in quantity is a delicate job. However, we did manage to properly ferment our apple juice and put it through the moonshine still that we’d bought. Voilà! About 1 liter of 150-proof alcohol. But before it could go into a gas tank, we would still need to filter it through zeolite (a volcanic rock), to remove the last water from the alcohol. Thanks to Northern California’s temperate climate, the gardens could keep producing all year round. We built several machines to process all the food, including a solar oven and a solar drying cupboard. We were also given a grain mill. But there was still no way that the two of us could process all the food that the garden was producing. So we started a community U-Pick for the 2008 harvest. About six families regularly came by and picked from the Energy Garden. They noted their harvest in a ledger book, which was tallied at the end of the month, and they paid farmer’s market rates for the food. Trying to produce usable fuel is very difficult, and the Energy Garden really helped us all see why petroleum is so extraordinary and valuable, and why, given its dwindling future and climate effects, we should be trying to use as little of it as possible. It was also a chance to make and use many tools, to see firsthand how to increase food security, and to understand fuel systems better. Based on our experiments, we decided that at the home scale it’s better to concentrate on growing food rather than fuel, while generating electricity with solar and wind power, and practicing energy conservation and efficiency. In the end we would admit that, though the energy crops were crowd-pleasers and fun to grow, biofuel is, for now, better produced by using waste products — fallen, unused fruit for ethanol, waste cooking oil for biodiesel, and waste organic matter, including ruminant manure, for biogas. In the year and a half that the Energy Garden was producing, our efforts grew in many directions beyond the garden. More than 1,500 people visited and were inspired. The knowledge, seeds, and tools we collected were passed on to the community group Daily Acts (dailyacts.org) in Petaluma, Calif., who are incorporating these ideas into an urban homestead project. The Energy Garden was realized by many people, including paid staff and volunteers. There were always people wandering through, from the neighbor bringing snails from his garden for the chickens, to volunteers bringing their visiting relatives for a tour, to anyone walking by that our 4-year-old son could entice in for a visit. 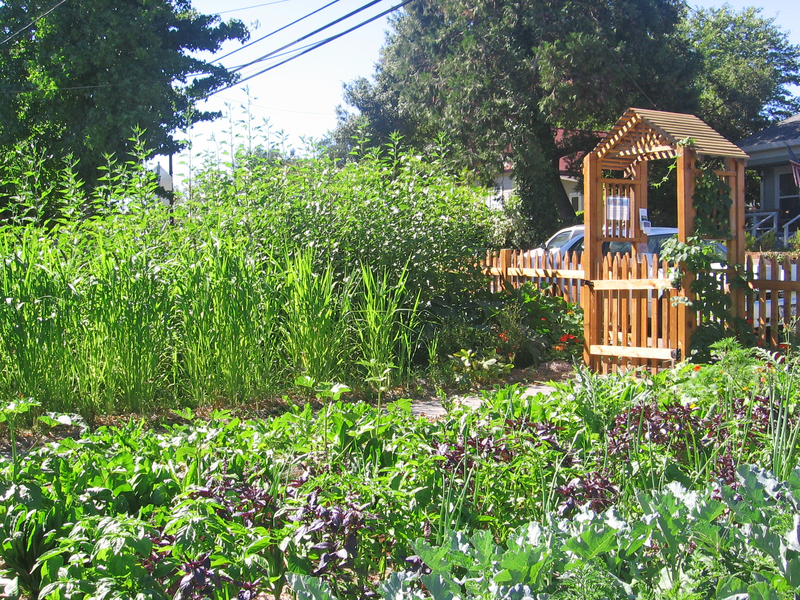 One thing that the garden did build — in addition to soil — was community.